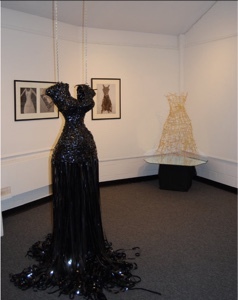 exhibit at the Woman Made Gallery, Chicago, IL Jan, 2010. 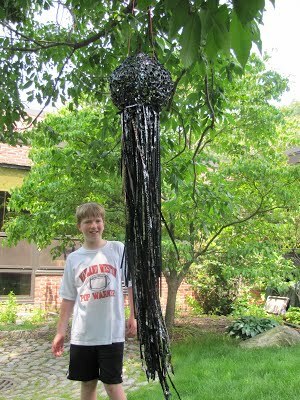 I made 'black widow ...' in 2008 when people were still using VCR tapes. Now when people see 'black widow ...' they ooo and ahhh as if VCR tapes are as old as the rotary phones. I got the idea when I got a glimpse at the insides of one of those VCR cassette. I saw this shiny, ribbon like material and immediately thought it would make a great dress. I noted that the VCR tape not only had this shiny black quality but it also moved with any kind of breeze and it was reflective and it also made a beautiful sound when it moved!!! All wonderful qualities to have in a material!!! And to highlight all these I decided to use a chicken wire armature for the bodice and weave the VCR tape into the chicken wire and then create the skirt by hanging endless ribbons of VCR tape. So as this thought was percolating I felt the need to close off the arm holes of the bodice, as a way of symbolizing how these messages and expectations presented by the media trap and stifle women. Once the bodice was finished I covered it with VCR tape in one of my favorite methods, weaving and then created the skirt. I do not know how many VCR tapes I used (wish I had kept track) and 'no' I didn't use particular movies (another question I am asked). After creating and showing the dress I did have MANY!! people asking if I wanted there old VCR tapes. It was interesting as I believe I witnessed the ending of the VCR tape era, as the amount of tapes that I was offered was mind-blowing. I did take many boxes because I do think that this is an awesome material. It seems to be weather-proof as well. In 2012 I did a workshop with the Happy Hollow Elementary School in Wayland, MA where the Students and I created a jellyfish out of VCR tape. Click here to see a blog post about my visit to the school!! A last note about 'black widow ...' is that I feel it also reflects my personal feeling about watching TV can be the death to creativity, imagination and so much more. "Americans spend an average of 29 hours a week watching television- which means in a typical life span we devote 13 uninterrupted years to our TV sets! the biggest problem with mass media isn't low quality- it's high quantity. Cutting down to just an hour a day would provide extra years of life- for music and family, exercise and reading, conversation and coffee." That is a little over 4 hours a day which equals 13 YEARS!!!! !I am the person who, in college, learned that you spend about a quarter of your life asleep and I tried to stop sleeping - that didn't work...you need sleep, but TV?!? Eleventh in a series of a wonderful growing community of supportive and talented photographers of all skill levels. 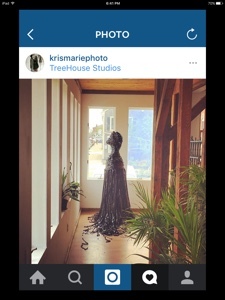 We will be photographing at the amazing TreeHouse Studios of Kristin Hughes-Craig located at 84 Court Street,Plymouth, Massachusett with professional lighting, backdrops and a projection screen! We will be photographing the lovely model Capri Lanning-Cafaro. 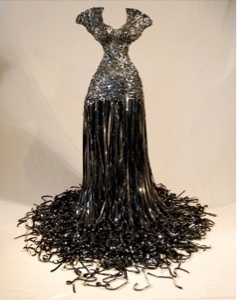 Capri will be interacting with artist Virginia Fitzgerald's hauntingly beautiful dress sculpture, "black widow . . ."
There will also be plenty of helpful guidance and suggestions to enhance your passion for artful photography. Feel free to invite your friends or share this invite! Parking is street and parking lot on side of building. Also there is a public parking lot behind Plymouth Memorial Hall across the street. We will meet at 10:30 am for meet and greet (refreshments provided). The wildly talented @Steven Lanning-Cafaro will be playing classical and flamingo acoustic guitar for this special event!